Charles James, Charles JAMES, CHARLES JAMES! A couple of great messages popped in my in-box this week. If you look closely at the top, you’ll see that the back piece has a triangular extension at the waist that wraps toward the front, and my pattern has that as well. The pattern also has three vents, which are actually low pleats, at the two sides and the back. 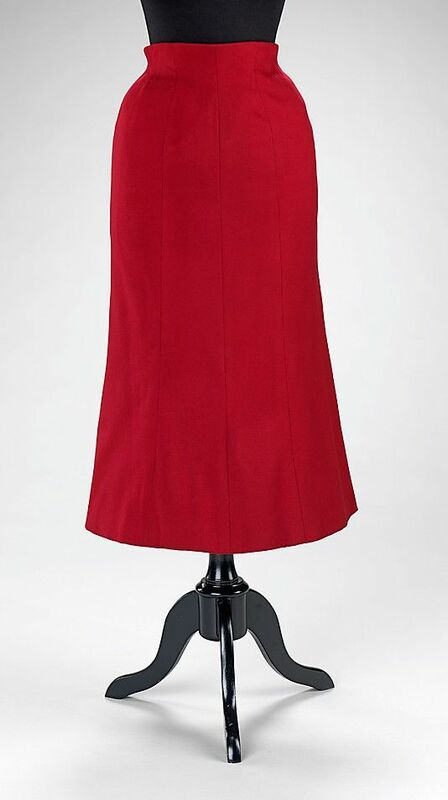 It’s on my wishlist to make as well, though I’m more of a “Dorothy” than a “Tulip.” This pattern has small sewn-in interfacing panels all around the bottom to make the hem flare out. 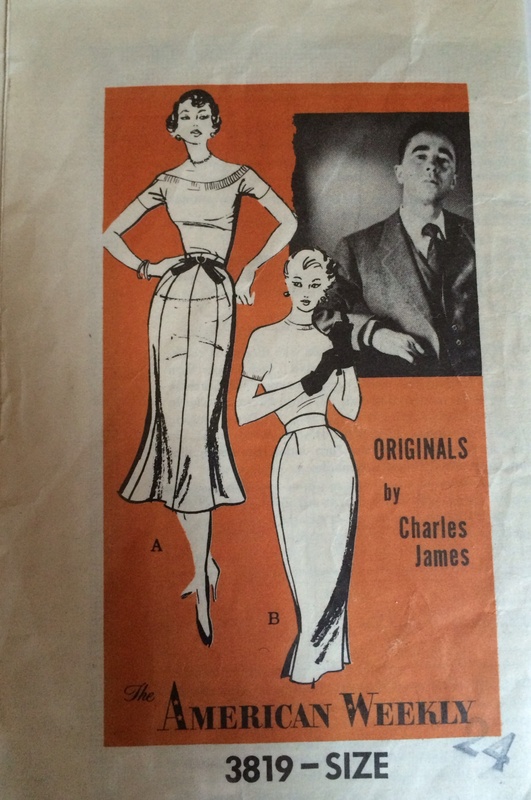 Like many true artists though, his perfectionism ultimately did him in, and he ended his days working with a single patternmaker in New York’s famous artists’ fleabag, the Chelsea hotel. 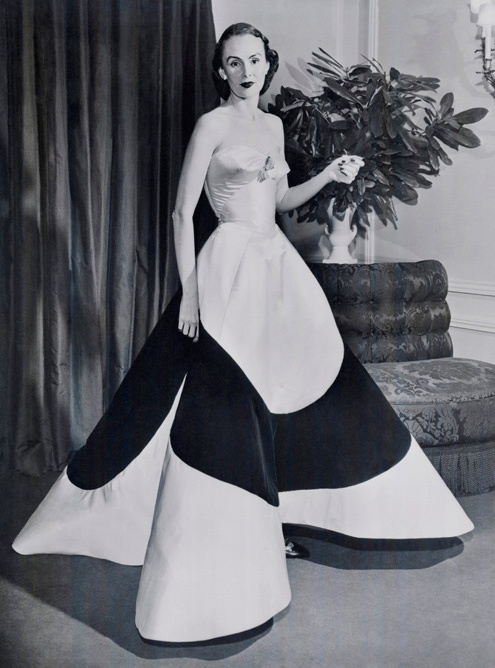 There’s a great article in the New York Times today by writer Elaine Louie, who describes knowing Charles James in the 70s, and wearing one of his gowns to an exhibit: (“Charles James and Me” article) It’s a fun read. I better get going on grading (sizing) up that pattern–it’s cut for a 24″ waist! 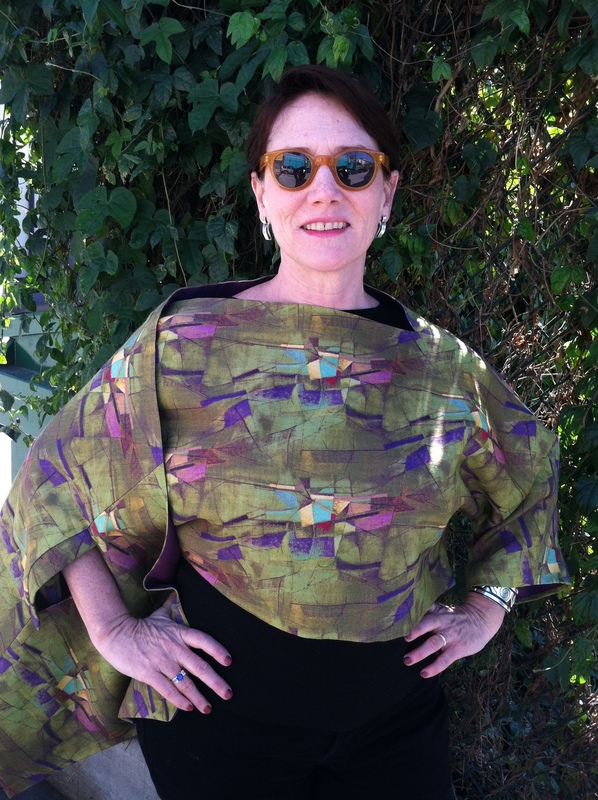 And thanks again to my sister…Janet, I’m so looking forward to you taking a day off from running the Martha Graham dance company to be the photographic intern for Jet Set Sewing. What a gal! The second fun thing that popped up in my in-box was a nomination for a “Liebster Award” from Carrie of Crafted By Carrie. Carrie is a scientist by day and sewist by night, who is putting together her trousseau and gifts for her wedding party and a bunch of other stuff while I’m sitting around across town procrastinating about tracing my vintage patterns. The Liebster Award is bestowed by bloggers onto other bloggers to help spread the word about new blogs. I really appreciate being nominated and Carrie, you are a Liebchen for sending me the Liebster. 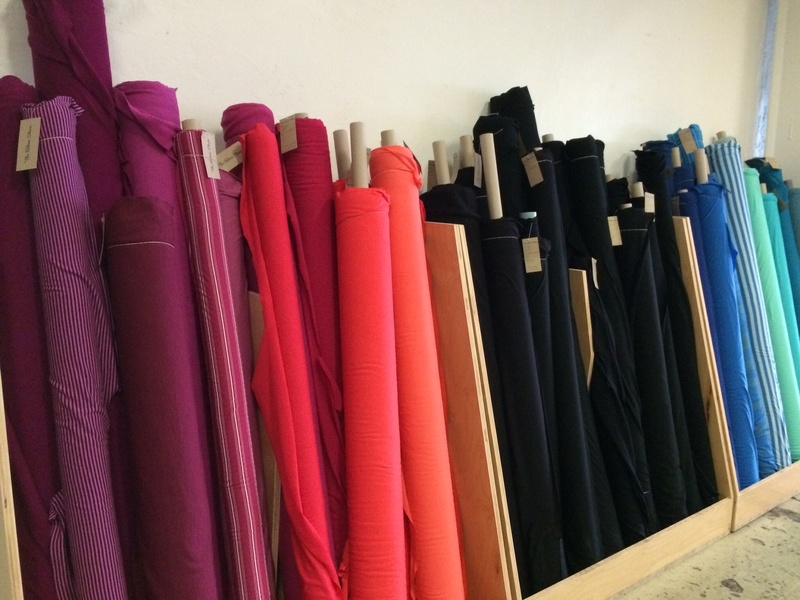 What is your favorite garment you’ve made? Yes, I won’t shut up about it. You know, at this age, discretion is the better part of valor. What is your favorite period in fashion, and why? Well, I could write a blog about this, and that’s what I’m doing. 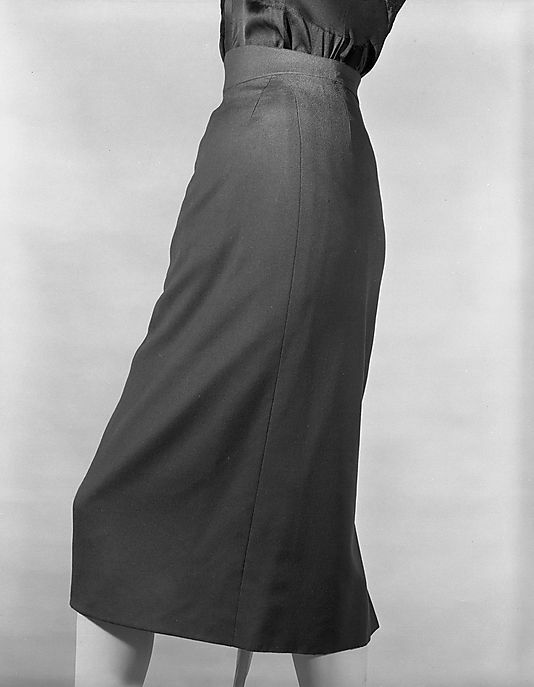 I’m a fan of 1920s through early 70s designer fashion, though the cuts from 1950s and 60s suit me the best. What quality in a friend is most important to you? We’re all so busy that if they “like” my posts on Facebook it’s pretty exciting. 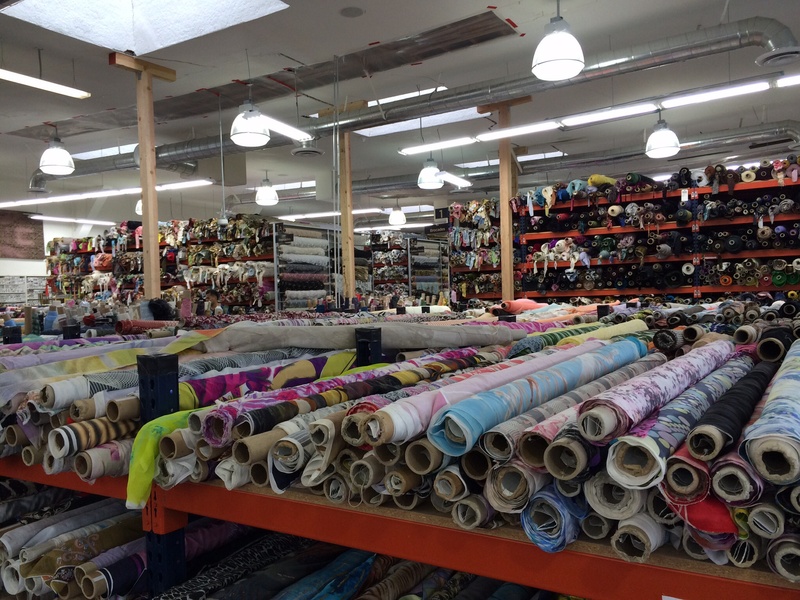 Oooo, let’s go to fabric heaven, shall we? One morning in L.A., I announced to the boys that I was going to the fabric store, and not hearing any response, I grabbed my purse and ran. 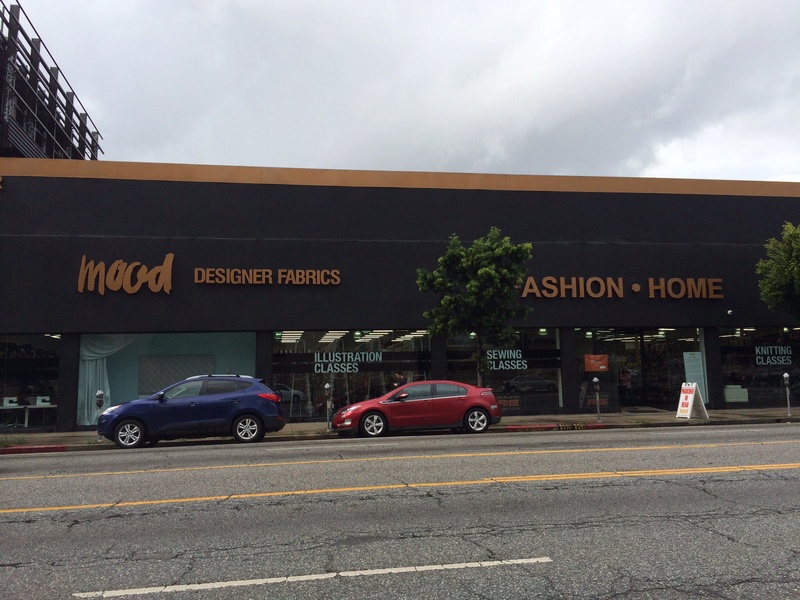 I drove south on LaBrea to Wilshire to hit the new giganto outpost of Mood Fabrics (645 S. LaBrea Ave.). 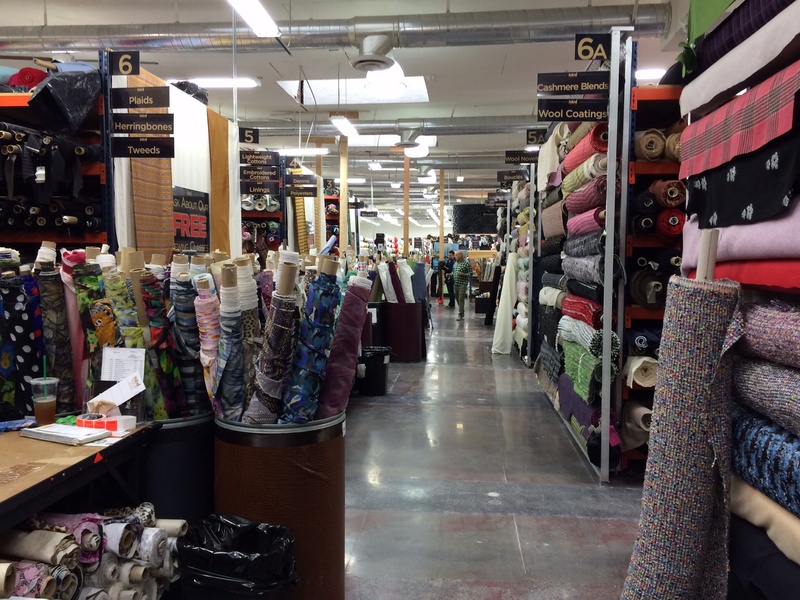 (Mood Fabrics Website) I had been to this location a year ago soon after they’d opened, so I knew it was huge, but now they had twice as much stuff. 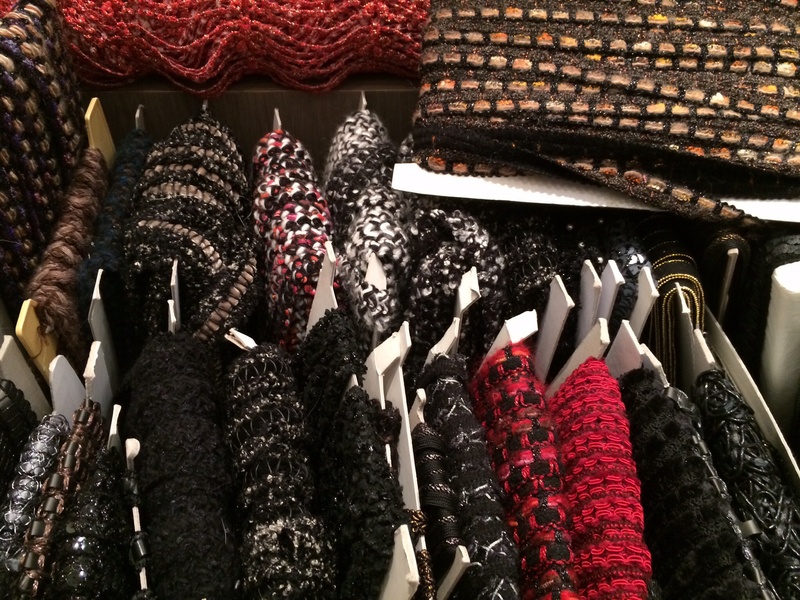 Fashion fabrics on one side, leather and home dec on the other. A bunch of women sitting around in muslins enjoying one of Mood’s FREE sewing classes. 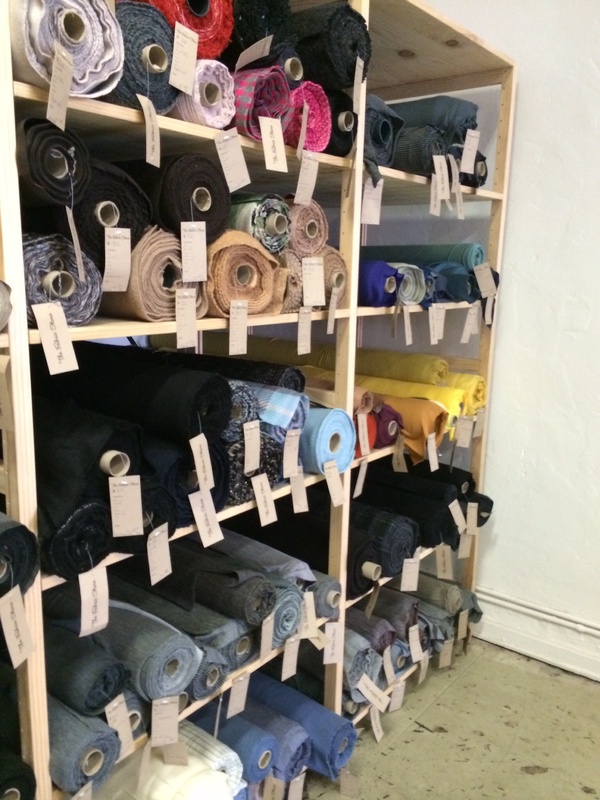 (Sewing classes at Mood Fabrics L.A.) Behind that wall of fabric rolls is another class of cute grade-school age kids learning to sew. The L.A. 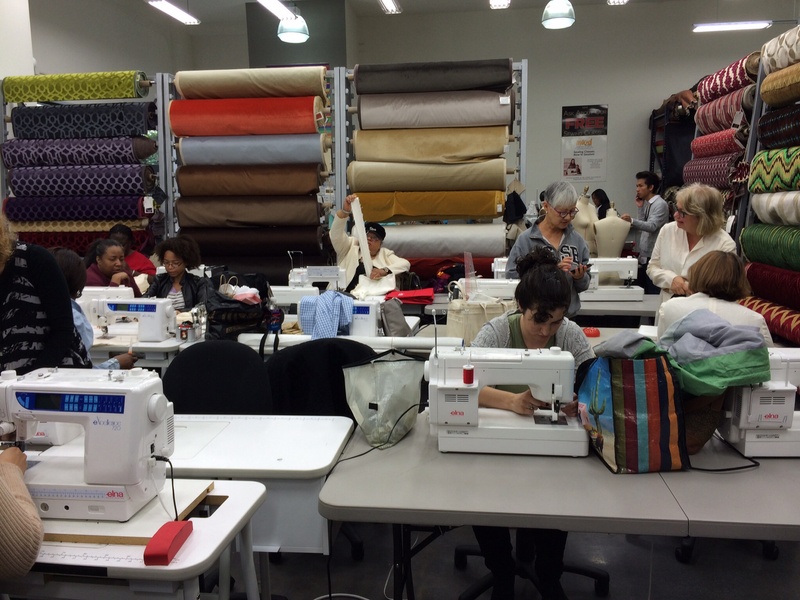 Mood location offers a mind-boggling array of sewing/draping/patternmaking/designing classes for free, often taught by professional designers and costumers. 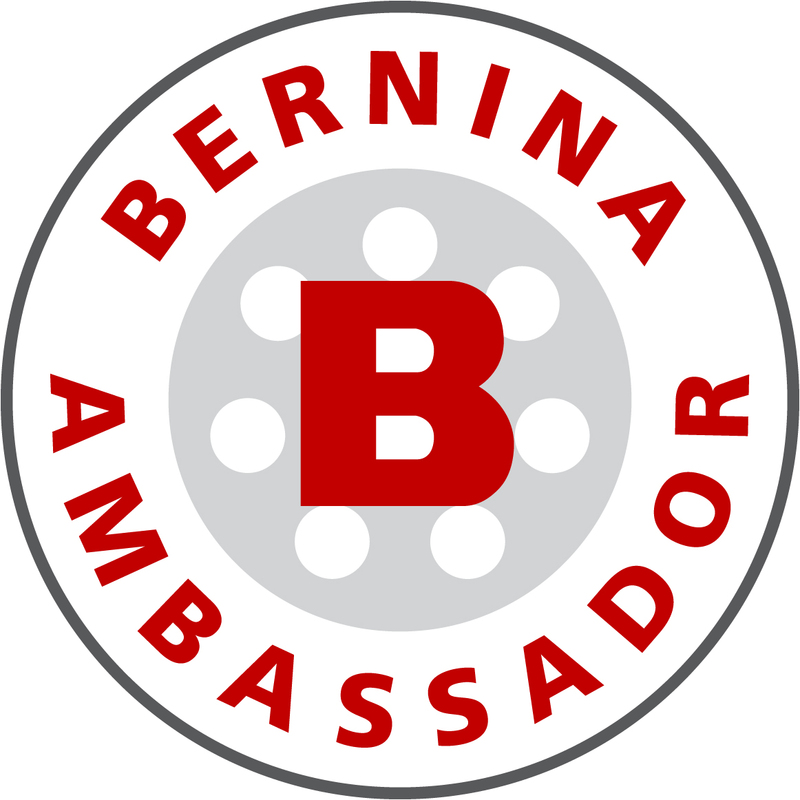 Every time I get one of their emails, I want to immediately decamp for L.A. and make up a little bed for myself among the linens and raw silks. 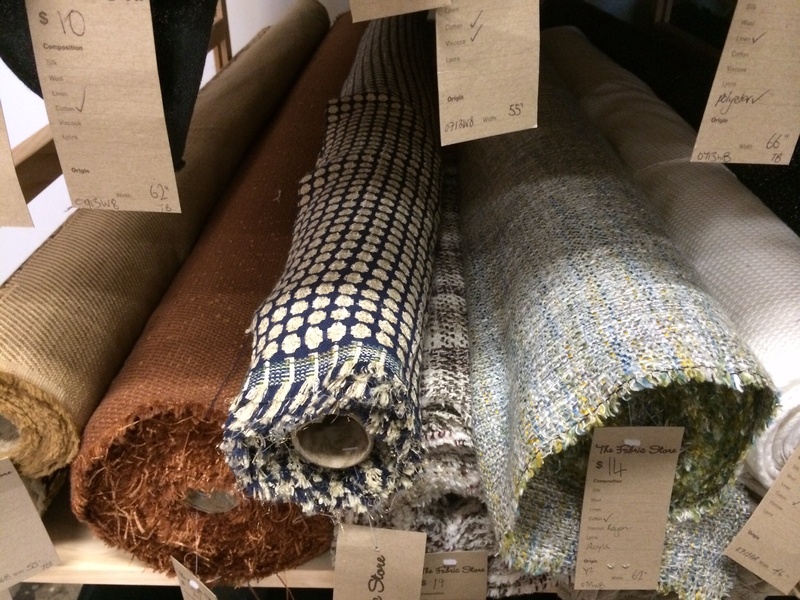 In complete contrast to the “packed to the rafters” feel of Mood, the Fabric Store is in an open-plan store front with wooden tables and shelves, and sedate zen-y music playing. 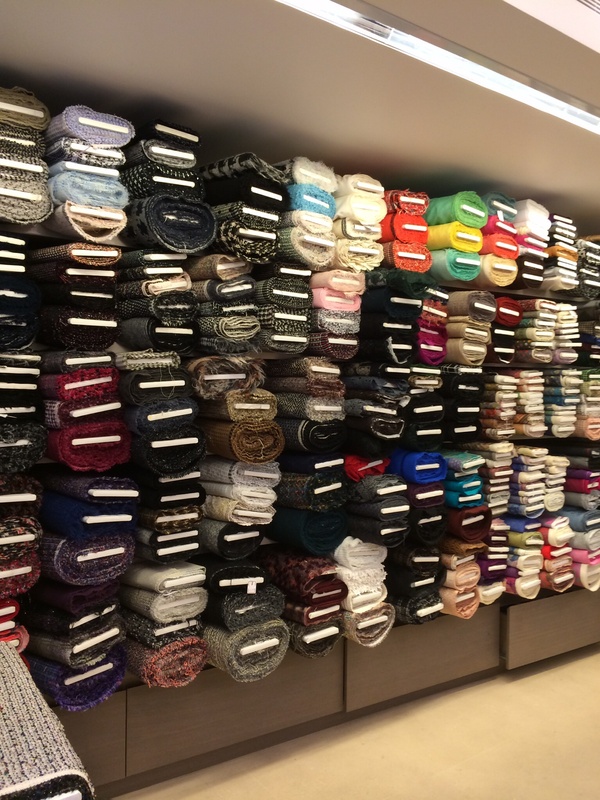 But The Fabric Store’s claim to fame is their high-quality New Zealand merino wool jersey, which come in a range of weights, colors, and designs. 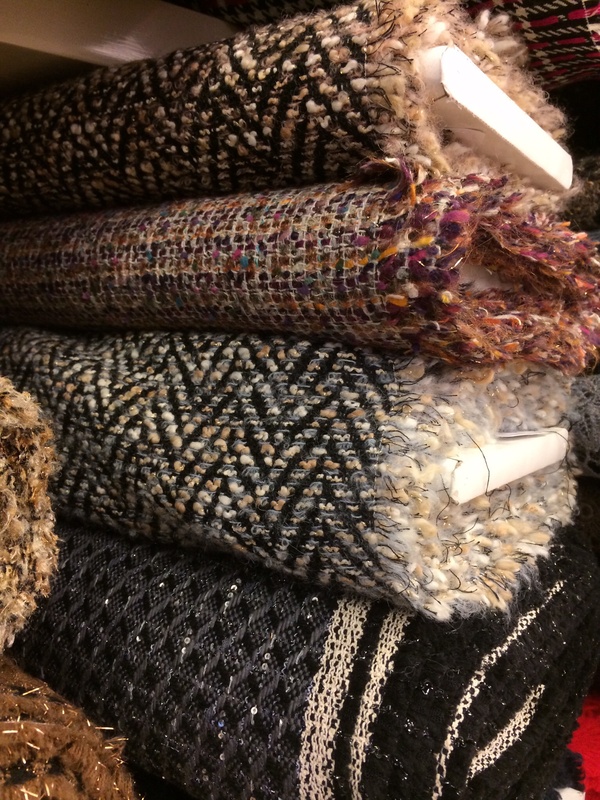 They were really something, and most were under $20 a yard for a hugely wide swath of jersey (up to 62″ width), all of it smooth, itch-free stuff. 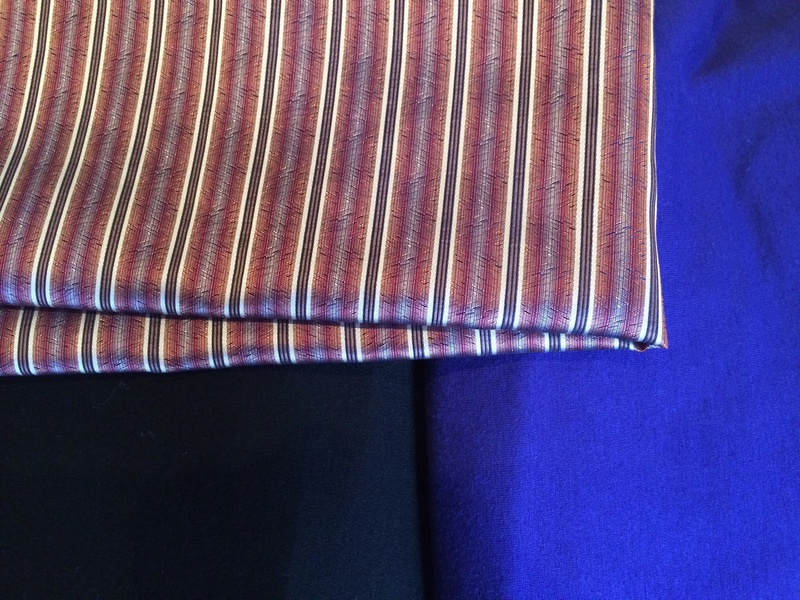 I ended up buying some lightweight black New Zealand 100% merino jersey, a periwinkle/royal blue Italian wool/viscose jersey and some “tie” silk, all pictured above, and believe me, I could have gone home with more. I have since machine washed and air-dried swatches of both wool jerseys and they came out perfectly. 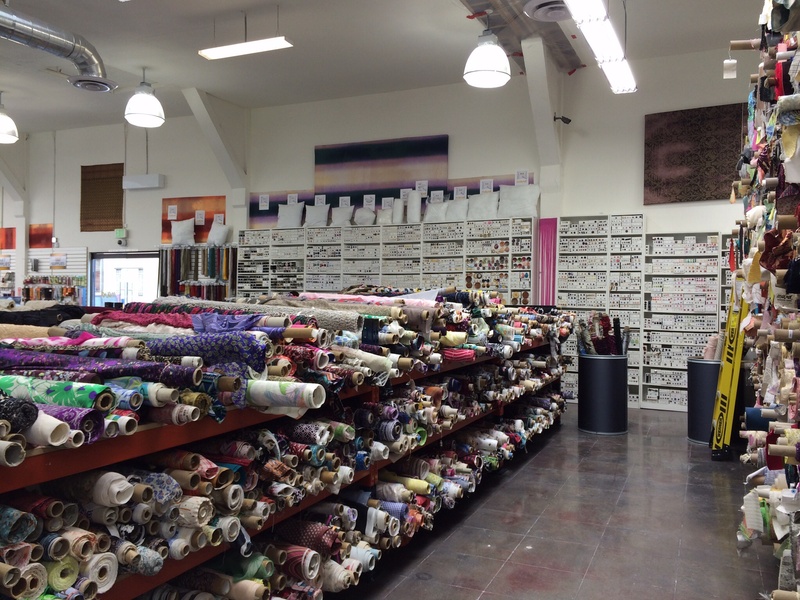 I’ll definitely be stopping by The Fabric Store on my next trip to L.A. 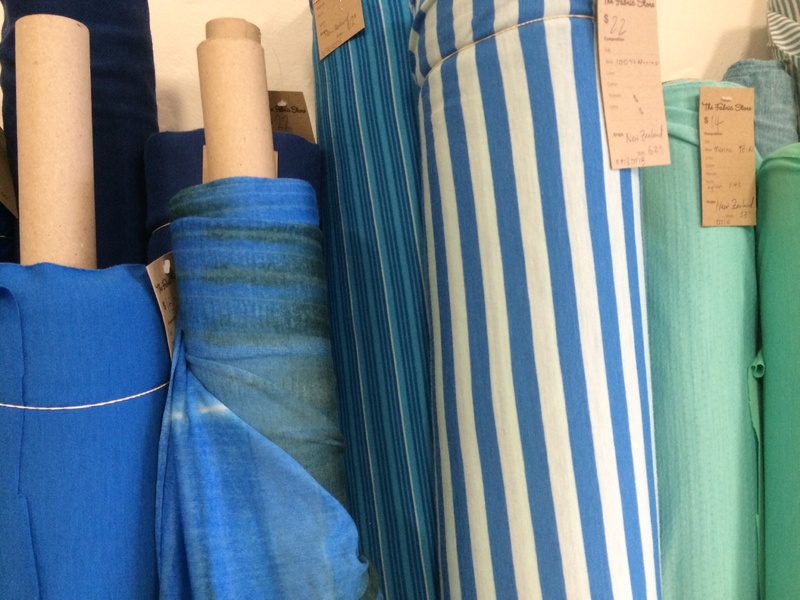 The one L.A. store I didn’t get to this time, but highly recommend, is International Silks and Woolens at 8347 Beverly Boulevard, less than a mile from The Fabric Store and Mood. 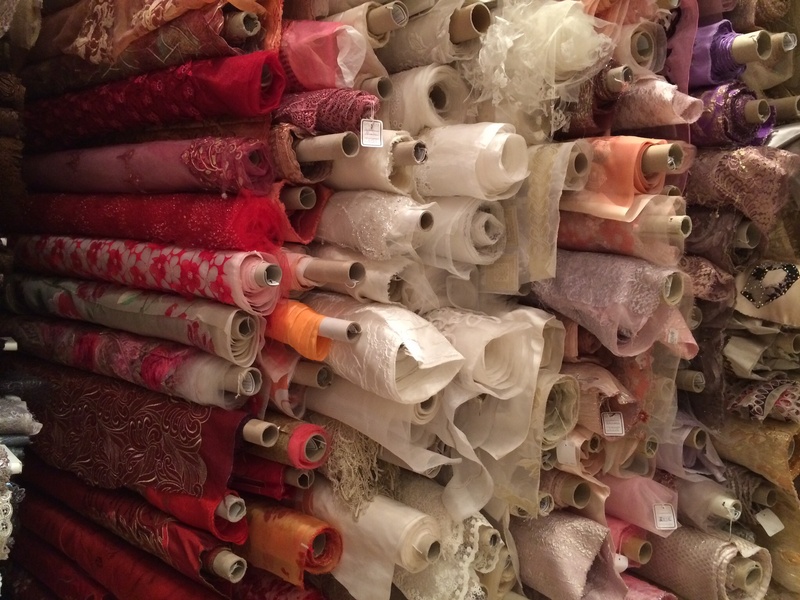 (International Silks and Woolens Website) When I visit, I go straight to the little room on the 3rd floor where they have authentic vintage fabrics that look like they go from the 30s to the 80s. 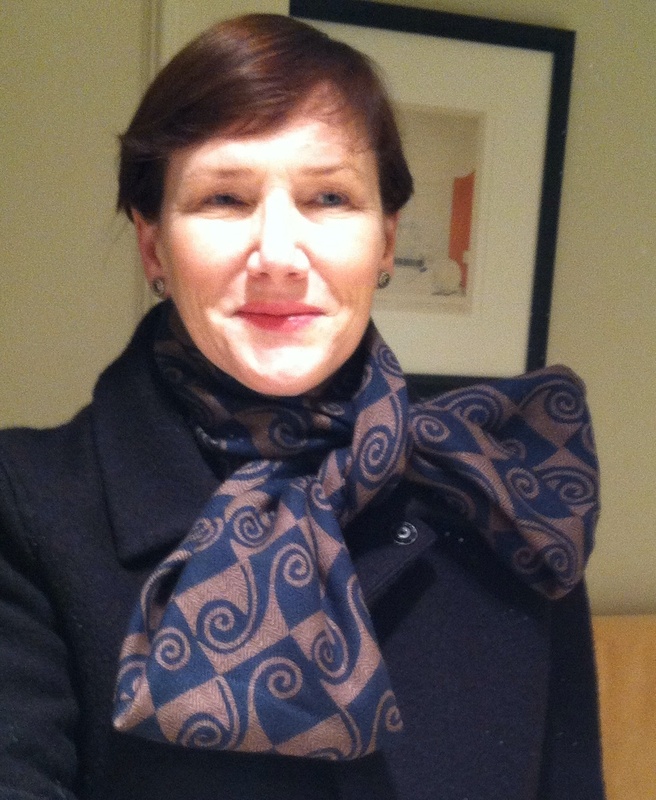 They’re not cheap (usually around $40/yard), but you can find unique retro fabrics like the one I used to make this Madeleine Vionnet bias scarf. 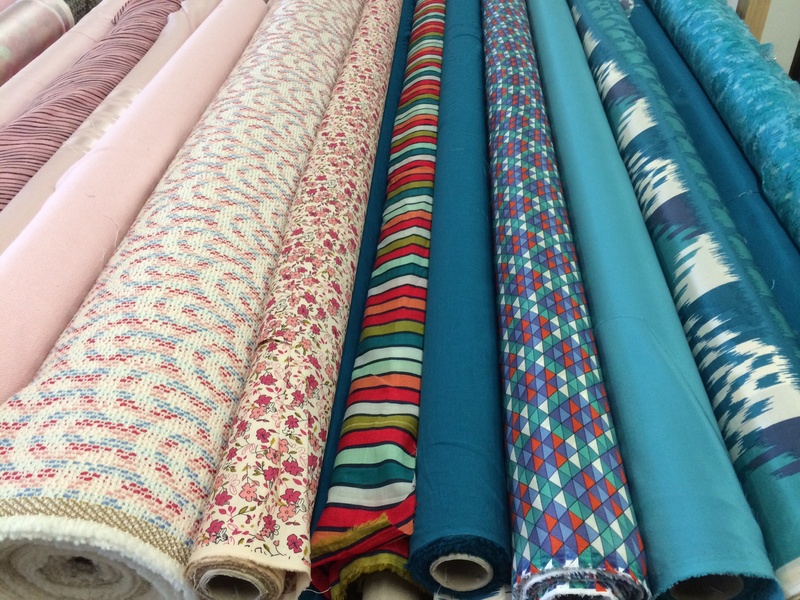 If you do buy any vintage fabrics, inspect them carefully as they may be faded at the fold, so you’ll need more yardage. 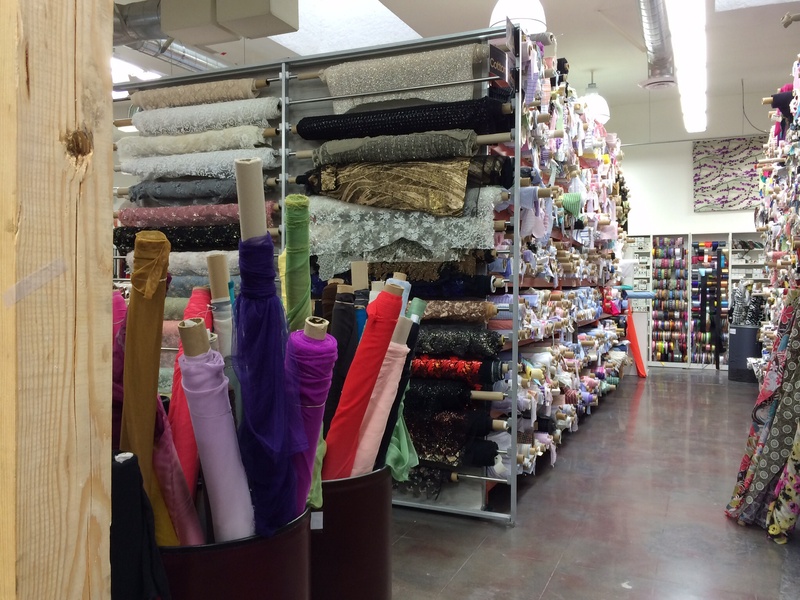 There are a number of other great fabric/sewing/costuming stores in L.A., and if you have been to any of them, let us know what you think! 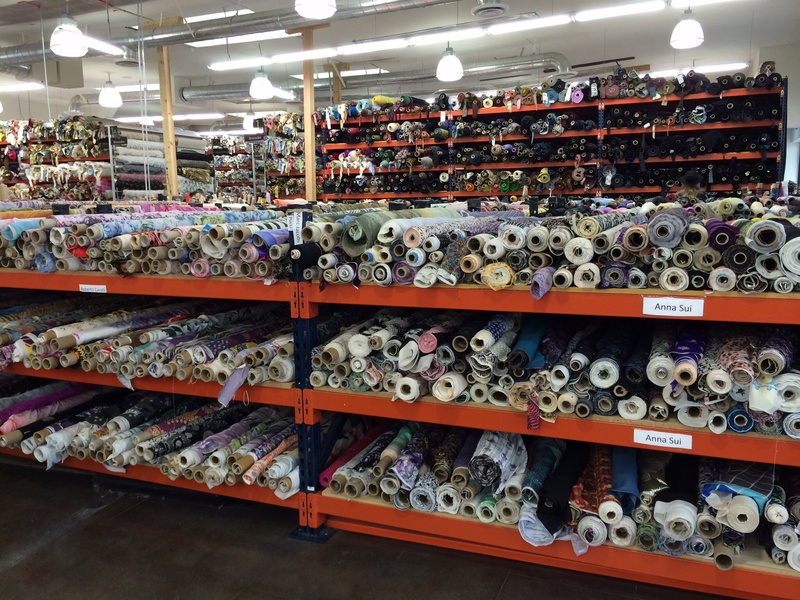 Now to make a dent in my stash so I can go fabric shopping again. 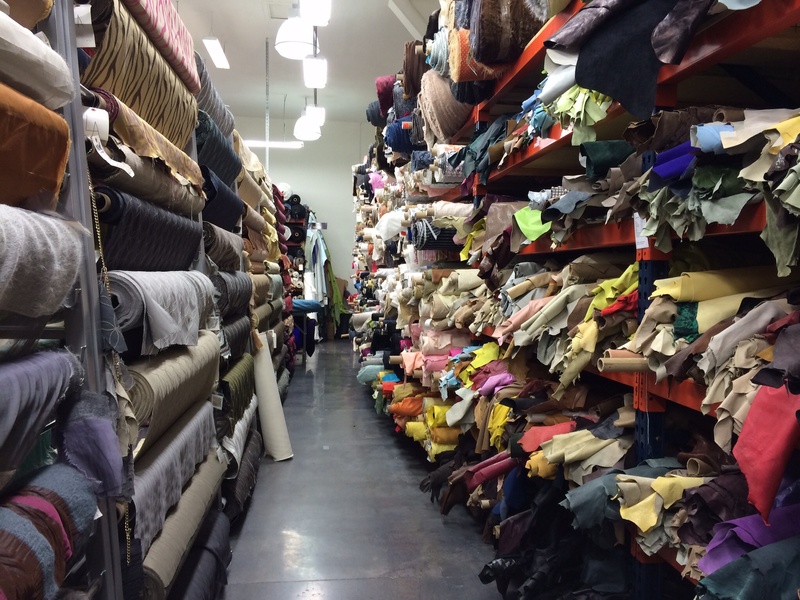 Fabric shopping in Paris and…Steampunk Chanel? Hello again, friends. 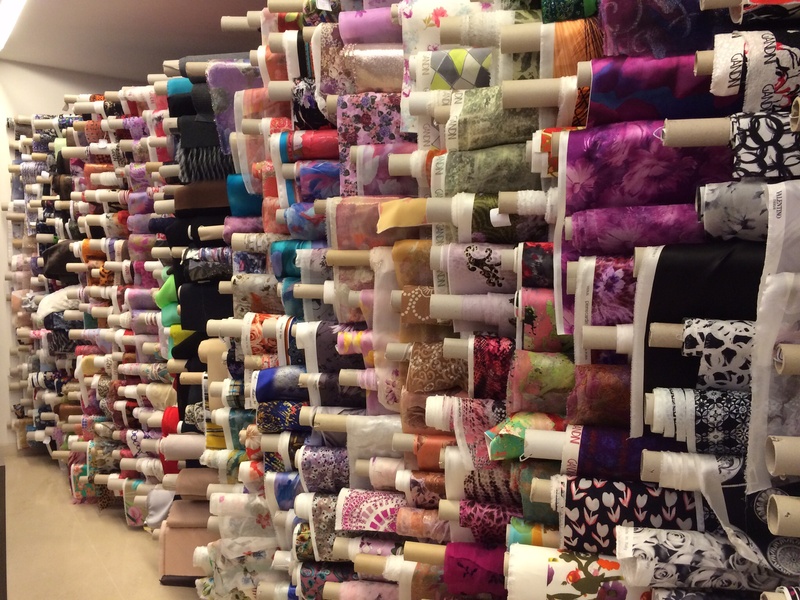 Having been forcibly removed from Paris by train and coerced by family members into days of sliding down an Alp on a couple of laminated boards, which was then followed by slumber-inducing 5-course French meals, I haven’t had the opportunity to update you about the Paris sewing outpost that puts the FAB! 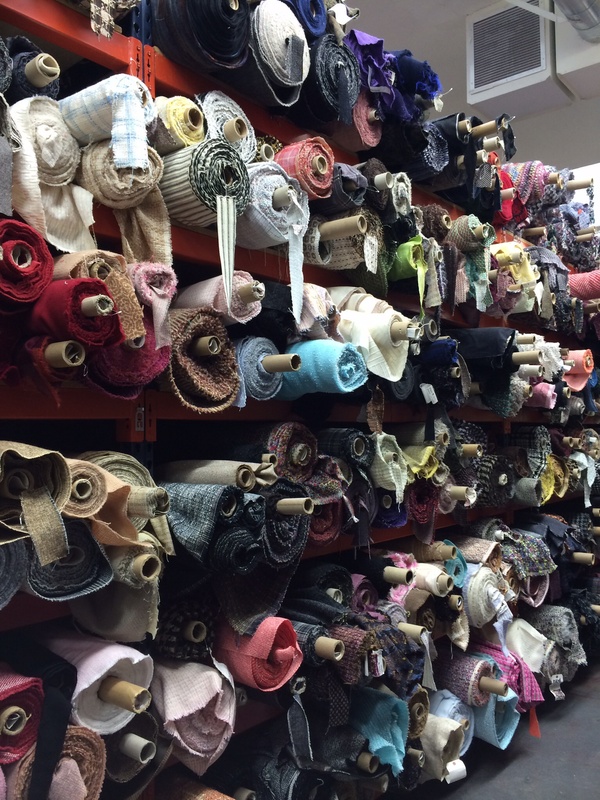 in “fabric”. In a previous post, I wrote about last year’s visit to Janssens et Janssens during which I pounced on the remnant table and then attempted to move into the place permanently, as I had basically spent the mortgage before I left. Like mecca, I had to return. 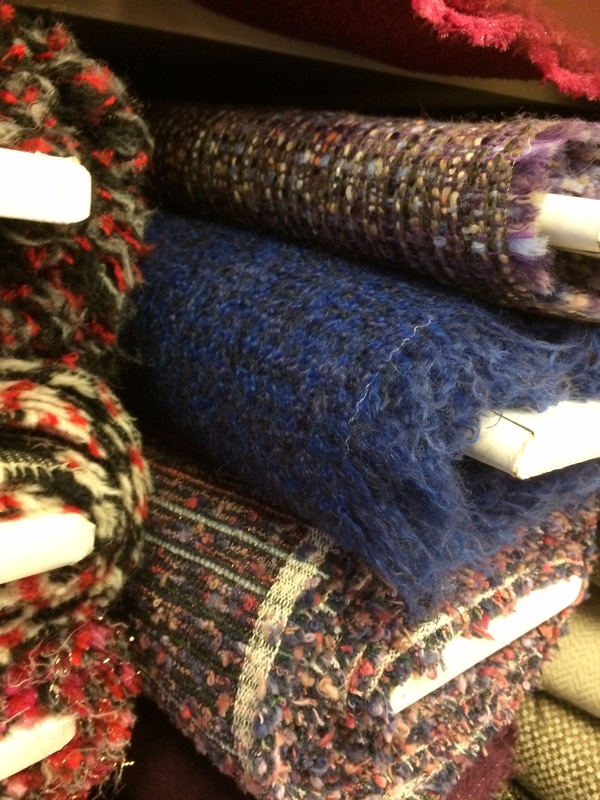 Feast your eyes on those delicious tweeds. The fancy stuff’s in the basement. All of these things pictured can be found at Janssens et Janssens, at 3-5 rue d’Anjou, at the corner of rue Faubourg St. Honore (janssensparis.com). 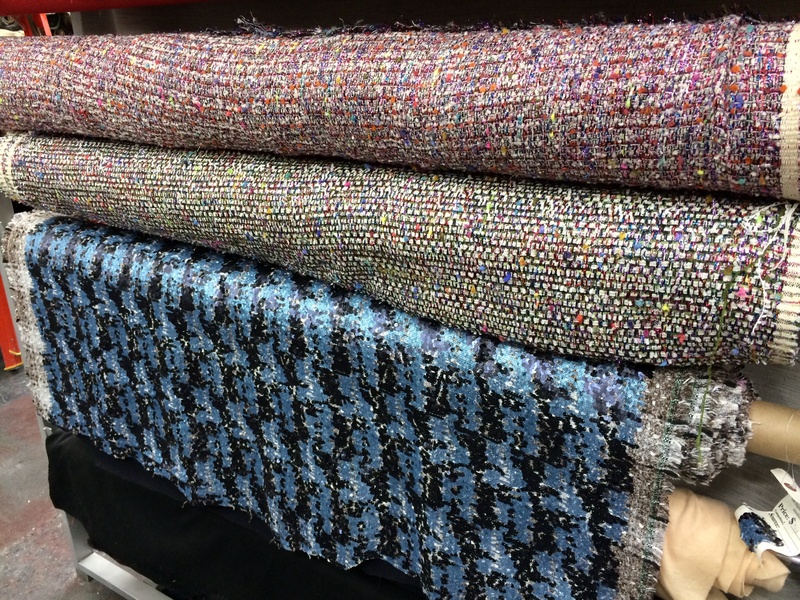 While I was there, I bumped into another American blogger and fellow Chanel jacket obsessor, Mary, of the blog “Cloning Couture.” She’s already whipped up a pretty spiffy tweed jacket, and I’ll be watching her blog to see what she makes from her Janssens haul. So now after my nightly couple three glasses of wine, I’ve had time to reflect on the year ahead. I’m going to move on to American Look designers! I’m going to make things that are easy and fun! 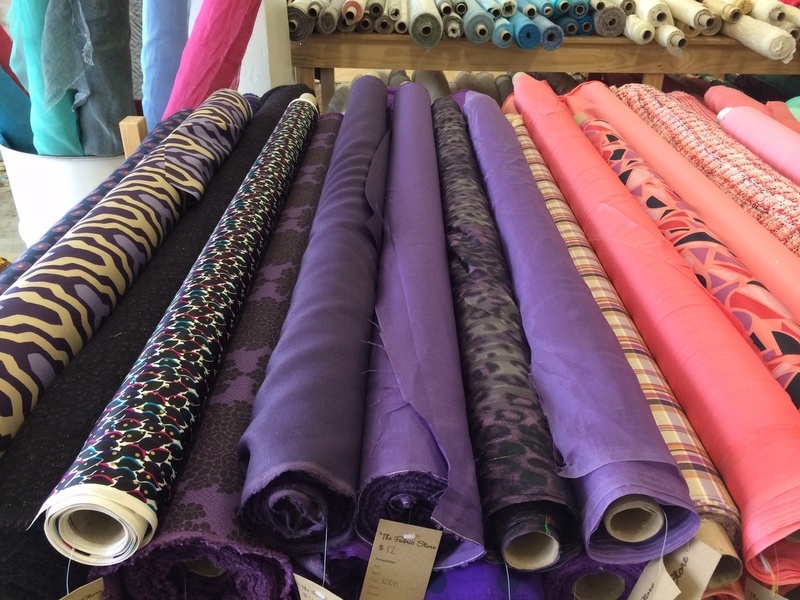 I’m going to endeavor to make a dent in my massive fabric stash, and in the meantime, not buy anymore! 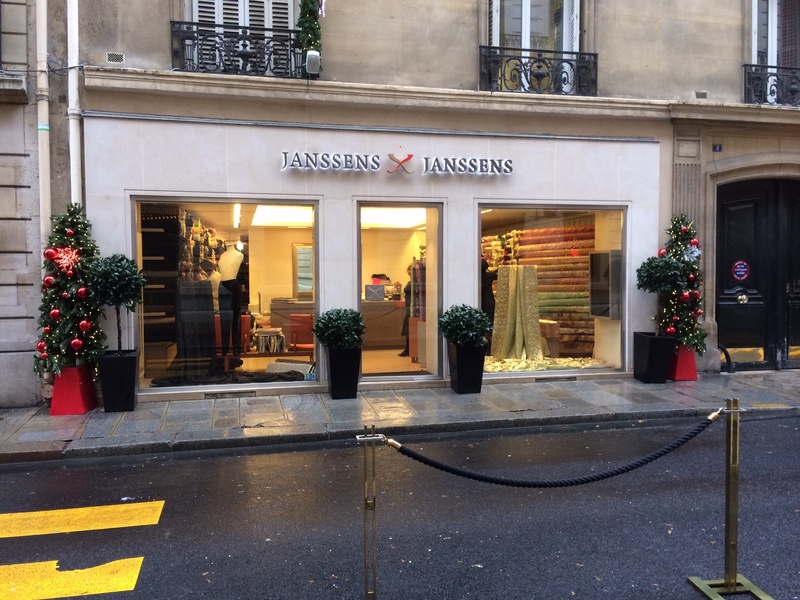 But really what I’m thinking is…the minute my feet hit the ground back in Paris, I am running to Janssens et Janssens, to get me some black tweed. 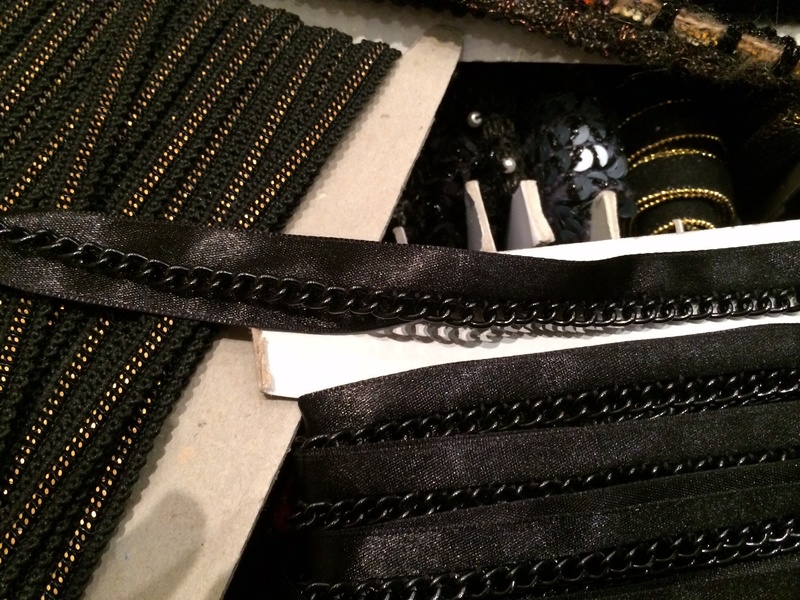 See, I bought some antique brass snap tape at Bon Marche, and the grosgrain with brass chain imbedded in it at Janssens (above), and well, I think it’s time to bring the funk to Chanel. I’m talking a Steampunk Chanel jacket. Steampunk is a look cooked up by people who got tired of being punk or goth or anime or whatever and came up with this Buck Rogers meets Wild Wild West (60s TV show that’s impossible to explain) look where they dress like Edwardian aviators or motorists and decorate their iPads with antique watch parts. It’s a great look for the guys, though the women tend to look more like Liza Doolittle (pre-makeover), “Little House” schoolmarms or Miss Kitty, the saloon girl from Gunsmoke, and I say this knowing I’m going to get in trouble with the entire Steampunk community for this post. Just google it. I’ve got to hand it to the Steampunk people, though, they really get their sewing on. 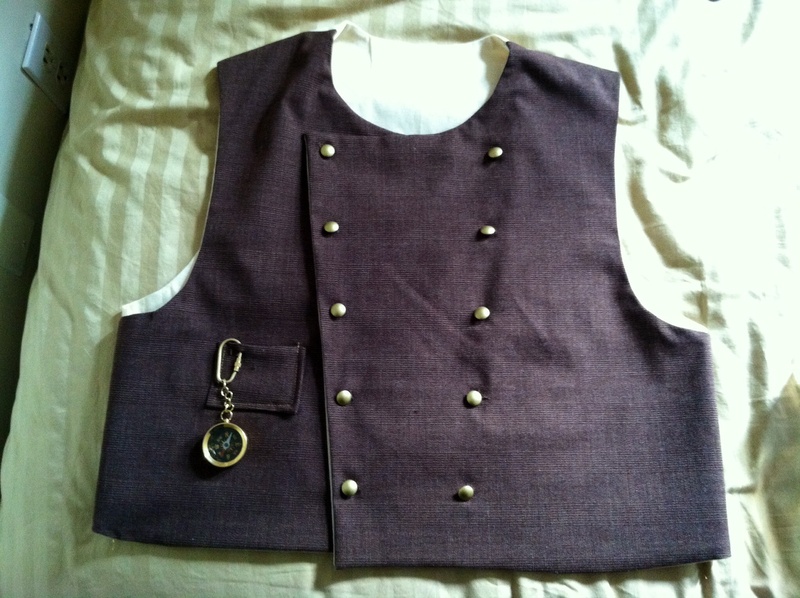 As a vintage sewing hack I was thrilled when my son wanted to be Steampunk for Halloween, and in the midst of cranking through Chanel jacket #4, I powered down and made him a Steampunk vest, in the course of which, I learned to bag a lining. From a Big Four costume pattern! Chanel herself was plenty Steampunk, what with the Liza Doolittle hats and layers of hardware. And Lagerfeld, well, all you have to do is make his outfit sepia-toned and he’s good to go. So the jacket of my reverie is going to be black, with antique brass snap tape to hold it together, and a brass chain tape at the bottom. It will need a lining that’s either Beaux Arts flowery or maybe 20s Singapore Chinoise. Will I try to bag it and then quilt it? 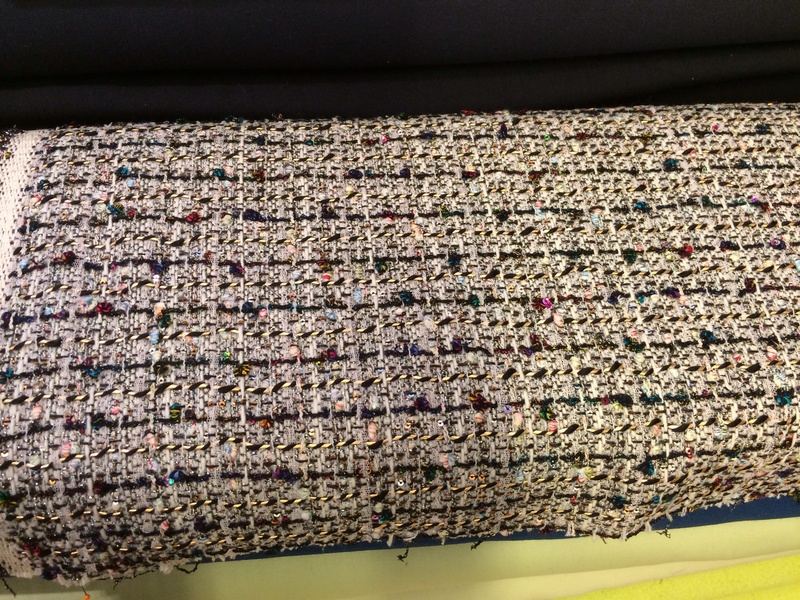 Or stitch the whole thing together wrong sides together and fringe the raw seams then quilt it? (like I did in Chanel jacket #3, my “fake it till you make it” Astronaut Wives Club raw silk job) And the trim, the trim, hmmmmm… this is how I get in fabric trouble. Was I dreaming? I believe that if you’re in your mid-fifties and still doing vintage (and honey, I was a 40s pin-up in the 70s, when old clothes first became “vintage”, and young Bette Midler was singing “Company B”), vintage needs to be a) wearable in public, and b) not too costumey. And it can’t look like it’s still in your closet from way back when. And when you make a Chanel jacket repro, you do run the risk of looking like granny having brunch at the country club. So you’ve got to funk it up. Steampunk Chanel. Of course! All of those chains and faux baubles, so Machine Age. Another glass of wine and I’ll have figured out that trim. What do you think; should I go for it?